Tsugaru Kanayama pottery has been strongly influenced by sueki, which used to be produced centuries ago. It is created by the yakishime method, involving firing and hardening the pottery at 1,350°C without using any glazes. The finished pottery features a truly unique and sophisticated texture. The kiln can be visited year-round for free. 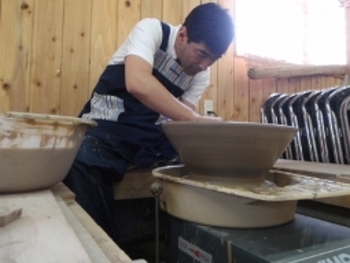 There are also pottery workshops with easy-to-understand instructions from professionals. Visitors can make pottery using a wheel for professional use. Trimming and firing after clay shaping will be done by the studio staff, so even tourists on a day trip can participate in the workshop. hand-crafted Visitors can make pottery of various types, such as dinosaurs and dolls as well as dishes and cups. Rental manual pottery wheels are available (100 yen) for those who wish to make neatly shaped circular objects such as dishes.